During the Sunset Champagne Cruise, guests ride the prevailing wind as the sun casts pink shadows on Table Mountain. 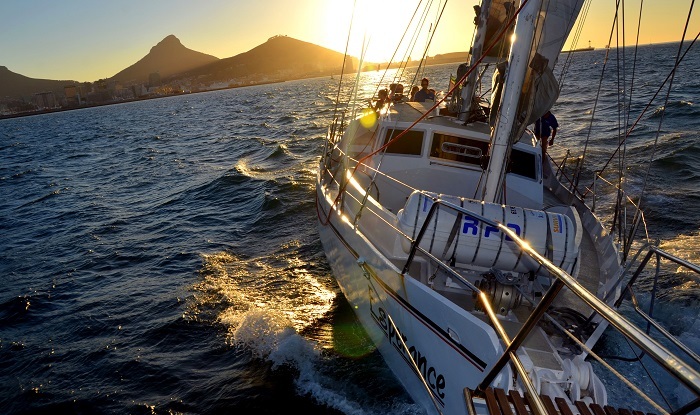 With a complimentary glass of South African bubbly to salute the setting sun as it dips beyond the horizon, passengers will enjoy a cruise into the ocean that gives perfect views of the iconic Cape coastline. It’s a relaxed and family-friendly cruise, where the highlight is the natural and nautical experience. There is also an on-board cash bar that can provide an array of additional beverages and refreshments. Please keep in mind that the sunset timing changes slightly during different seasons. For the exact timings, please check the Water Front Charters website. Please make sure you bring your ID in order to receive your glass of bubbly if you are over 18. You will also want to bring weather appropriate clothing and most definitely bring a camera to capture the beautiful views. Bookings are recommended. Guests must redeem their iVenture Card offer at the booking office in order to receive a booking pass. Pre-booking can be done by phone or email or visit the Waterfront Charters office at the V&A Waterfront. Alcohol served on the vessels is for persons over the age of 18 only.